So, in one week and one day, we get to find out if we're expecting a boy or girl. To me, that's when pregnancy seems real. You get to buy things, pick out names, clothes, design the room, and start referring to your baby in a loving term, other than "it". I have even felt "it" move! Much earlier than the 24 weeks it took for me to feel G move. For fun, we tried the "baking soda test." Apparently, you put 1tbsp of baking soda in the bottom of a disposable cup, pee on it, and see if it fizzes. (To me, it sounds like a huge scam to get pregnant women to do silly things, but, I'll play along) So, I peed on it. No fizz. 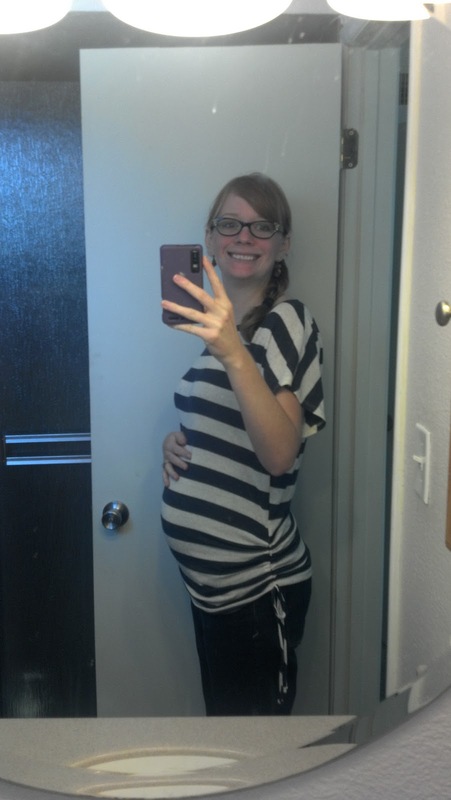 I have my pregnant friend Amanda (due 4 weeks after me) do the same thing. Hers fizzed. Fizz is supposed to mean boy, no fizz means girl. Only time will tell if this test is accurate! After the research I did, it appeared to be 60-70% accurate. I will ask that you all say a prayer to make sure baby F is healthy, and growing like a weed. (Although, I am sure he or she is) My mother and father in law have been praying for this babies birth. My father in law has been having a hard time "picturing" how the birth will go, but, he had a dream that I was tired and happy. Hearing that nearly brings tears to my eyes. I already feel so positive about this child and birth, but it is nice to have positive vibes all around. My mother in law said she saw me pushing in a squatting position, as did I.
I have contacted the local Birthing from Within teacher, and am all set up to start classes in January. I'm very excited. Sounds right up my alley! Pregnancy has been going well so far, except that I've gotten a cold with terrible congestion that is finally gone after 2 weeks, and some other throwing up ick that my daughter brought back from day care. We are all finally feeling better, and I am hoping it continues! I've been attending ICAN meetings every 2 weeks, and love getting together with the ladies! Nothing more powerful than a bunch of pregnant ladies on their birthing journeys. I am praying for you too Jesse. But I already know that everything will go as planned, because of your determination and faith. So you didn't tell us what a fizz and no fizz mean. I have never heard of this and want to try it! :) (we don't know what we are having) So which one is boy and which one is girl? If I remember correctly, fizz is a boy, no fizz is a girl. Well! Look at me being thorough. Pregnancy brain? Fizz=boy, no Fizz=girl. SO, Girl?? ?